If you grew up around the time I did, well, for one, you’re kind of old. But two, Colorado being bad at football is pretty damn odd. The early memory of Colorado was the whole 1990 national championship split with Georgia Tech, and basically hindsight is 20/20 and we should be pretty darn glad Twitter didn’t exist after the Fifth Down or the called back Notre Dame touchdown in the Orange Bowl. That was your indoctrination of how odd this college football stuff was when people were talking about votes and schedules for championships rather than how it looked with all of the other sports. Colorado was never that good again, but they were never really bad, either. They provided one of the more memorable moments of the 1990s in college football, the Hail Mary to defeat Michigan (damn that play!). There was a Heisman winner in Rashaan Salaam. You had memorable talents and characters like Kordell Stewart, Eric Bieniemy, and Michael Westbrook. Even into the BCS era, Colorado survived. Chris Brown just scored another touchdown on Nebraska, and in that murdering of the “previously on-track to play for a BCS title” Cornhuskers, it was such a thrashing that they only needed to complete one pass in the second half by their starting quarterback to get it done. And then for the most part, it was over. Colorado would go on to appear in only four more bowl games from then until now, the last coming in 2007, and now we’re looking at a CU team that has won six games over the course of the past two years and is in Pac 12 basement hell and the place floods every time it rains. But the glass isn’t always half empty. Sometimes it’s just half full of air, right? 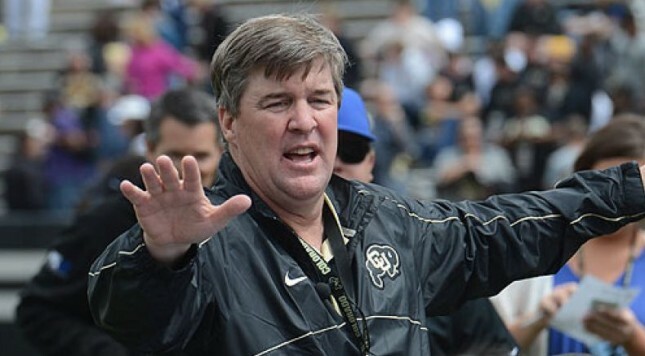 Mike MacIntyre enters his third season at the helm and CU fans should be feeling good about things. After all, MacIntyre does hopeless situations pretty well. Part of the allure of his hire was how he was able to turn left-for-dead San Jose State around in three years, from one win to 10 with a 5-win season mixed in for good measure. At the time, the Spartans were nursing all of three winning seasons since 1993 and this was entering 2010. That’s quality futility. Academic Progress Rates had slapped the Spartans with extra weight to carry around, often carrying anywhere from 10-15 fewer scholarships allotted to make any revival even more arduous. MacIntyre had the luxury of the program getting back to 85, and with an offense-friendly system coupled with mining the JUCO ranks, SJSU picked itself up off the death mat of college football to have some pretty successful moments. Again, 10 wins at SJSU in his third year, this being at a program with three winning seasons since “Whoomp (There it is)” was a chart topping single. Man, that song was brutal. MacIntyre was smart enough to know at SJSU that you just tear it down to the bricks and mortar to find out where the issues in the foundation were and you build from there. He’s also smart enough to know that even though you do that, you don’t have an eternity to get the job done, lest you watch someone else finish out the contract on the work. If you want to maximize your life span in college football before all that stuff about hot seats and what not comes up, you lose pretty fabulously in Year One. People will look the other way as you try to strip down the program to build it up in your vision. It sounds insane, but that’s typically how you’re going to keep the job longer. Incremental improvement will be seen as “getting better” and you get more rope. The other end of the spectrum is going all Brady Hoke and having your best season first and dealing with weighty expectations that eventually crush you because they can’t be met to anyone’s satisfaction. Still, no one who coaches anything advocates losing. Sometimes, when you strip it down to the bolts, that’s what happens. Jon Embree didn’t leave him much tearing down left to do, though, to be honest. This is the year, however, that CU should see some serious improvement. Former (and successful, mind you) South Florida head coach Jim Leavitt was brought on to help the Buffs’ 116th-ranked scoring defense from 2014. MacIntyre has Sefo Liufau, who has a year and a half of starting quarterback experience in his satchel, and Nelson Spruce is back at the wide receiver position after catching 106 balls last year. The offense seems to be on the track MacIntyre wants it to be, and since that’s his specialty, just go with him on this one. The schedule is reasonably navigable. The Buffs open at Hawaii and then get three home games, Colorado State being the most difficult opponent of that bunch in the Rocky Mountain Showdown. It’s reasonable to suggest that they could be 4-0 right out of the chute. It’s also possible that 2-2 happens and there begins to be a wailing and gnashing of teeth. Then, you’re maybe looking at two wins to be bowl eligible, which is a reasonable goal. This reclamation project on paper looks like it should be easier than digging SJSU from football Hades since this is Colorado … a program with a history of success … but the Pac-12 is not exactly the WAC (where San Jose State was when MacIntyre rescued the program). The rough aspect for Colorado is that its swing games are on the road, games like Washington State and Oregon State. Being a rebuilding program and having four home games versus five away games in-conference doesn’t really help the process. But this is what MacIntyre was brought to Boulder to do, spin his brand of magic that worked at San Jose State and do it in at least a reasonable amount of time so long as he could do it his way. In Year Three, SJSU finished the season ranked in the BCS top 25 for the first time in school history, and finished with a spot in both the Associated Press and USA Today polls, a testament to the fact that people took notice of the work, including his fellow coaches in the USA Today poll. So for all of us folk who cut our teeth getting into college football when Colorado was a routine embodiment of success, take solace: The process may be long, but things are trending in that direction. For C0lorado fans, have faith. MacIntyre has done this sort of thing before. Don’t bother with whether the glass is half full or half empty. Just get on board and put some more Kool-Aid in. In the end, this thing will work out fine.